Over 4,000 fans came from all corners of Singapore to see the man of the moment, Psy, in the flesh and they certainly didn't go home disappointed. 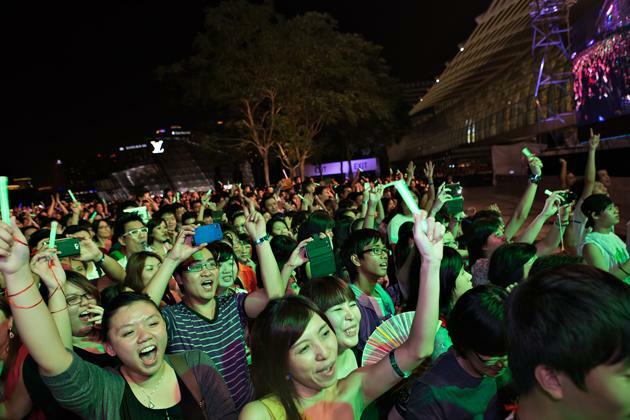 Young and old, male and female and from teens to parents who brought their young 'uns to see the "horse dance" master himself, every one rocked out to the free three-song showcase from the "Gangnam Style" master himself. Safe to say, by the end, Park Jae Sang aka PSY, 34, had the crowd eating out of his hands by the end. Dressed in his trademark black suit and sunglasses, Psy launched into his three-song setlist with rap number "Champion", to which he got the fanatical audience to chant "Champion, Champion" with him. "Show me energy and I'll show you energy. I want every single person to jump!" he yelled midway into his second song, "Right Now" as he stopped the music to get people to dance. Maybe it was because the audience were saving themselves for the best but they finally exploded into life as Psy, by now transformed into a sweaty, bobbing ball of energy, launched into third and final song, "Gangnam Style" to super shrieks of excitement. What followed was ultimate pandemonium as 4,000 fans jostled for space to rock out to the smash hit dance that has been seen over 850 million times and counting on YouTube. Young and old, every one did the "horse dance" to varying degrees of success. "We only heard the last song "Gangnam Style" because there was a jam. My dad got complementary tickets from the hotel. It was very high and very fun but the concert could have been longer and he only sang three songs. We're not K-pop fans of K-pop but we enjoy both the song and dance," said Chua Jia Ling, 22, student, in between catching her breath. "We read that 4,000 tickets were given out so we were expecting a crowd. We're used to the event plaza space here so we know it's going to be kind of cramped at the event plaza space here. for a dance party, there's really not much of a space to dance. i was right at the back, so at least i had some space," said homemaker Ms Lily, who said she had checked YouTube to learn the dance moves. So has Psy gotten sick of his eponymous dance since it exploded into mainstream consciousness in June? "Sometimes, honestly, yes I get tired or I get sick of it because I got so many requests to teach them, you know, like average let me say 50 requests per city, per country," said Psy during a press conference earlier in the evening. "I already taught the dance to so many people, so many times but still the dance makes me here, to make a press conference in Singapore, so of course sometimes I'm tired about it, but I got to do it, it's my job," he added. But despite his "silly" horse dance, the dancing chubby Korean said he wouldn't change nothing as it got him to where he is — even if it meant staying chubby. "I'm not skinny but I managed to get famous all over the world with this body," he said in a quiet and reserved manner, a marked difference from his on-stage persona. "In the last three weeks, I've travelled to eight countries. Schedule is tight and crazy but I never lose weight. I don't know why... It's not going to happen for me," he continued. "I feel really strange and weird why I'm nominated for Person of the Year. It's not going to happen I think. I don't deserve that much. I just did my job and didn't participate that much. It's really an honour to be a candidate," he said humbly as he tried to downplay his global success, who along with Barack Obama and rapper Jay-z and daredevil Felix Baumgartner, has been nominated for TIME magazine's annual prestigious accolade. Classy as ever from the man who pioneered the phrase "Dress classy, dance cheesy".